Diffusion in metals is an important phenomenon, which has many applications, for example in all kinds of steel and aluminum production, and in alloy formation (technical applications e.g. in superconductivity and semiconductor science). In this book the data on diffusion in metals are shown, both in graphs and in equations. Reliable data on diffusion in metals are required by researchers who try to make sense of results from all kinds of metallurgical experiments, and they are equally needed by theorists and computer modelers. The previous compilation dates from 1990, and measurements relying on the electron microprobe and the recent Rutherford backscattering technique were hardly taken into account there. 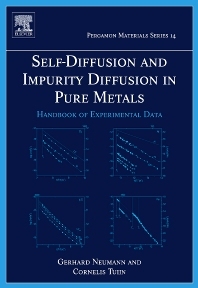 This reference book, containing all results on self-diffusion and impurity diffusion in pure metals with an indication of their reliability, will be useful to everyone in this field for the theory, fundamental research and industrial applications covered. Scientists working in the field of metallurgy as well as material design engineers and materials specifiers.